Suppose you don't remember or know what form this cryptic form ID represents? Click on the tiny view link on the Captcha page or on the show link in the Form store and you'll see a "best guess" preview of the form. For your own sanity it pays to quickly go over to the Form store and edit the description so you don't have to stare at the cryptic ID to long. 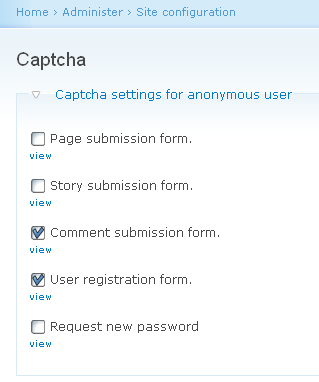 As you will see, a quick edit on the Form store makes the Captcha settings page much friendlier. If you want to test the modules, you can get them from the Subversion repository. You'll need both svn://heine.familiedeelstra.com/public/modules/mycap and svn://heine.familiedeelstra.com/public/modules/form_store. f you've used the Drupal.org Captcha module on your site you will have to truncate the session table before using MyCaptcha. Issue the query: TRUNCATE sessions;. This will log all user out. If you do not do this, you will get very odd math questions. I added support to your form store module in Captcha modules. I'll add a bit of help soon, then add it to the Drupal.org CVS repository. I'm aiming for a dev release at first, then — if sufficient users report it is stable — a quick 5.x-1.0. For now, the attached archive has to do. edit: Form store on Drupal.org. Heine & Fabiano, great work on this. I have installed the CVS Captcha and the form_store modules. Both seem to work perfectly on my 5.1 install.